Feeders come in a wide range of styles, sizes, and prices. They can be purchased commercially or homemade in just about every configuration imaginable. The one trait all these have in common is that they are all bulky and usually don’t come cheap. I have begun using an in-ground-feeder-set-up that has proven extremely effective in bringing in hogs and has a total cost of about $5.00. I start with a 55 gallon plastic drum. (Metal will work just as well but will rust over time.) I cut off the top of the drum so that the resulting bucket is 15 inches tall. Next, I use a shovel and bury the barrel so that the lip is just an inch or two above ground level. I do not drill any holes in the bottom of the barrel (not that it would drain much in the ground anyway), but I want as much moisture in the barrel as possible. If cut at 15 inches, the barrel will hold 150 pounds of corn. I then add Black Gold hog attractant to the corn and hope for rain or pour in water. The goal is to get the corn to begin to sour and ferment in the barrel. I know what you are thinking… “Won’t the hogs eat up all the corn in a night or two?” The reality is that the first few inches of corn will disappear quickly. The rest will require the hog to actually step into the barrel to eat further down. This is not a problem for one lone hog. However, when a handful of hogs are at the feeder at once, they will constantly be running each other away from the barrel and fighting to get their turn to eat. This offers you, the hunter, a much longer shot opportunity, especially when compared to a spin-type feeder where the hogs run in and vacuum up the corn and leave as fast as they came. 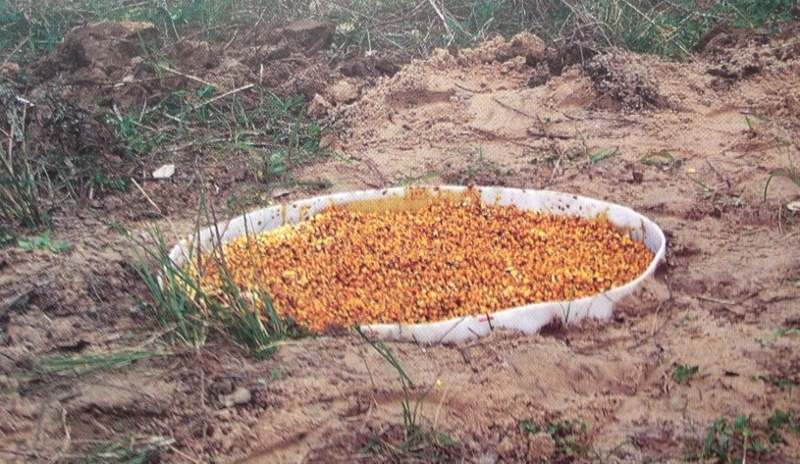 This feeder is extremely cheap, easy to make, and very portable when installing. It is a perfect solution for those out-of-the-way honey holes you can barely even get to on your 4-wheeler. Just another option for you to use to keep bringing in those trophy boars!